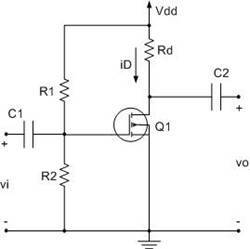 The Circuit setup is shown in figure 1. C1 = C2 = 10uF. The experimental circuit setup is shown in Figure 2. Rd = 35.9 ohm, for which, a 36 ohm resistor is used. 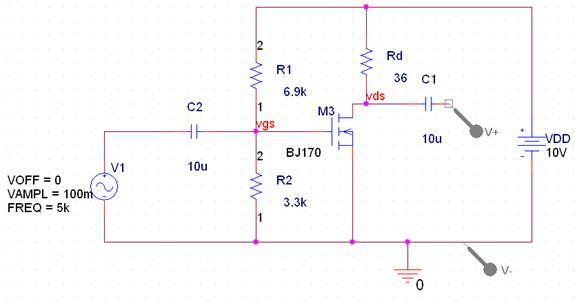 V(Rd) = Id x Rd = 0.0948 x 36 = 3.40V, which is not the ideal 5V. The experimental Vo =Vds = 4.384V. The Experimental values are off from the calculated value by the percentages shown above. The error maybe caused by the non-perfect transistor or non-perfect resistors. Q1) Qualitatively, describe what happens if Rd increase. If Rd Increase, then Vds decreases. Because Vds decreases, so Vo decrease, and the amplification decreases. Q2)Qualitatively, describe what happens if R2 decreases. If R2 decrease, then Id decreases. Since Id decreases, V(Rd) decreases, and Vds increases, so the Vo is increased, so the amplification increased.